Heart’s Delight and Butterfly Bliss. different ways to make and use these new products. Wow what a cute idea, for embellishing anything and everything. 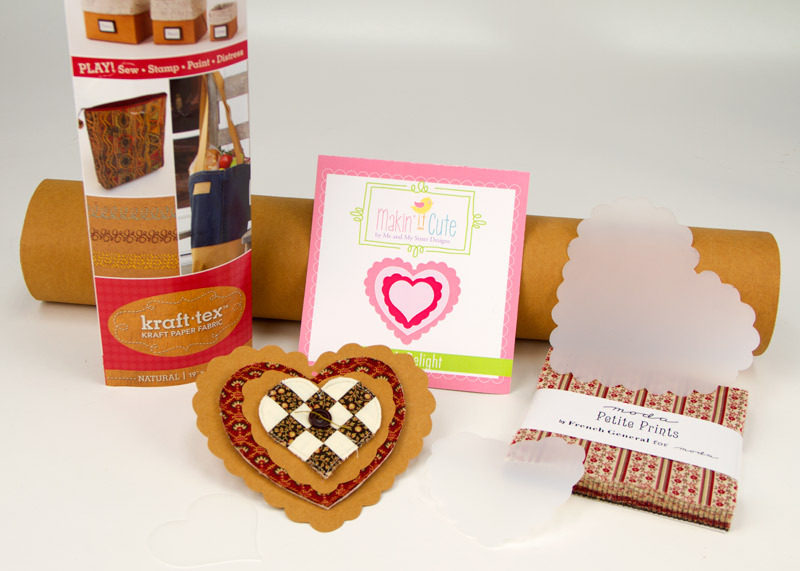 First up I used all the Heart’s Delight templates and created a country quilted heart ornament for the tree or a package. a washable paper fabric product that has all kinds of possibilities. Can’t you just see a Christmas package wrapped in red with this as a tag or ornament? I used Butterfly Bliss and Catalina Batiks (in stores now). such as old denim jeans. in the middle of the two layers of denim then sewn together and trimmed to size. I wanted it to look like angel wings on my sweet baby girl. Then I appliqued the smaller flutter-flies in batiks to jazz up the front of the jumper. great for bows or a chew toy for teething. will be chosen to win the two charm packs shown. Love the butterflies in batik – they look really cute! I love the butterfly and heart! So cute! I would have to put the butterfly on my daughter’s wall although it does look really cute on that little denim dress. Thanks for the giveaway! The butterflies are wonderful and I love the heart tag idea. Your jumper turned out so cute. I bet your granddaughter loves it! I would like to make some of these to decorate packages. Thanks for the chance to win. I love the hearts and butterlies!! I’d like to make some bunting! So cute!! Love it! Thanks for sharing!! The Butterfly makes the denim jumper so special. Love it. The butterfly looks gorgeous on that cute little dress. Very cute..thanks for the idea ! Love the flutterbye on the jumper! So cute!! Thanks for the fun! This is so darn cute. What a wonderful idea! They would look cute as a button on my granddaughter’s shirts. How could it be much simpler? Such a clever idea and so simple. Easy enough that there is no excuse for not embellishing with hearts or flutterbys. The charms are delightful, particular the little prints from FG. My grandchildren would love some butterflies. Too cute. Would be great to use the shapes as templates for free motion quilting on baby quilts. Adorable jean dress! what a lucky little girl! thank you! Very cute, love it ! Love the butterfly and heart! That’s the first I’ve heard of Kraft-tex. Interesting projects, thanks for sharing! 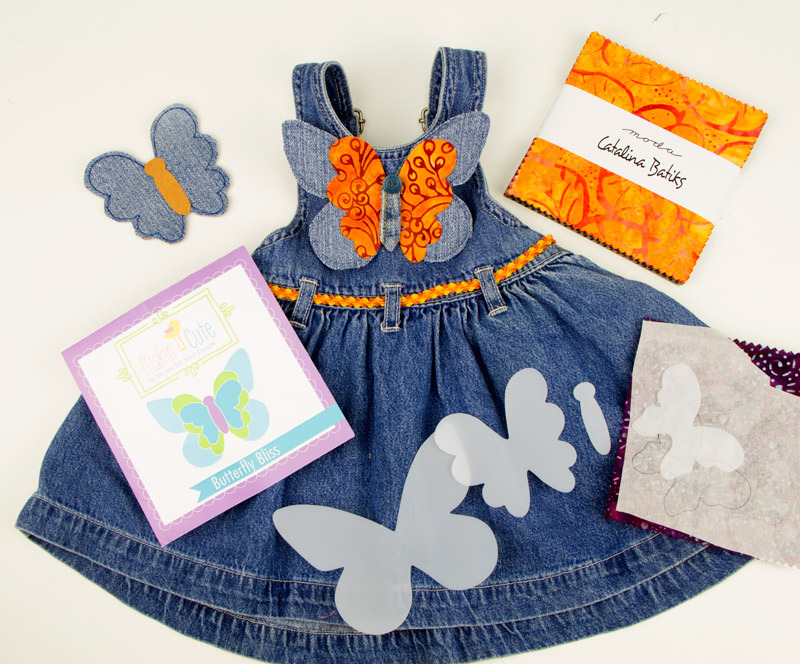 The denim jumper with the butterfly is absolutely adorable! Adorable–so cute on the dress!! With 6 great granddaughters to sew and quilt for, these templates would be just the best and easiest way to dress up their hair, clothes, rooms and quilts. Such a wonderful idea and thanks for the giveaway opportunity, which is really appreciated. your butterfly and heart are just too stinkin’ cute! i’d start off with new name tags for my quilting group. thank you for the opportunity! I am always amazed at everyone’s creativity. I love taking in all these ideas. Thank you so much for helping my creativity along. Adorable! Loved the piecing first idea and the jumper wings! Awesome! Love both of those charm packs and would be thrilled to won! Thanks! Aww! great ideas, as usual! Oh that butterfly is just adorable on that little jumper!! Your grand daughters jumper came out so cute, I love it! I just received my Makin It Cute flower set and it is fun fabulous! I can’t wait to put these adornments on everything! Love how you opened my mind to use fabric other than cotton, such as denim. I like the hearts. I agree with an earlier poster, we all need to be “making it cute” and wear little heart buttons. These are so adorable and can be used for so many things. Thanks for the chance to win some fabric candy so we can make the world a little cuter! Great ideas that you have shown! Love the applique. Can’t wait to try it on something for my GD. How cute, I think the Butterfly will also make a great hair clip for the little ones. What an adorable embellished jumper! I love thst the Makin’ It Cute templates are perfect for fabric or paper! Cute cute cute! And I’ve got some great buttons to use on these! Lovely. Can you share its tutorial?